Hannah Genders gets involved with an educational initiative . . . I am passionate about growing vegetables and have been ever since getting my first allotment about 15 years ago. We only had a small garden at the time and as well as it being a place for me to escape to, I took the children down to ride their bikes there. It also turned out to be a great place to learn how to grow produce from all the old guys who were experts and spent their days hanging out down there. I know they are still a great place to learn about growing, having visited lots of allotment sites for the TV series I did a couple of years ago, and although I don’t have an allotment now I have continued to grow vegetables in all the subsequent gardens I have had – and I still love it. We all know the taste benefits of growing our own, not to mention the factors helping us to reduce our carbon footprint; it’s basically good for us and good for the plant. With all this in mind I was thrilled to be part of a new project, with the challenge of getting all school children growing their own vegetables and planning to roll it out to the whole of the UK in the next two years. We have a major partner in BT, who are providing the communication network needed, and I am working with a grower in Cornwall (called Rocket Gardens) to ensure all the gardens are sent to the schools who sign up, as pre-grown plug plants. In other words, the vegetable garden for the school will already be grown and ready to plant out! This guarantees a much higher rate of success than just giving children or teachers a packet of seed, and it also means the whole garden is designed to crop before the summer holidays. So often the problem is that a class will start with some vegetable seeds in the first week after the Easter holidays; the plants grow well but they are all ready to harvest at the end of July – just as the children break for summer. To avoid this we have chosen plants that will all crop in June and early July, with a second garden available to plant out in the autumn term. This is called the “Grow your own Christmas dinner garden”, including everything but the turkey. With the little pre-grown (and, I must add, completely organic vegetables), comes all the fertiliser you will need for these lovely baby plants. 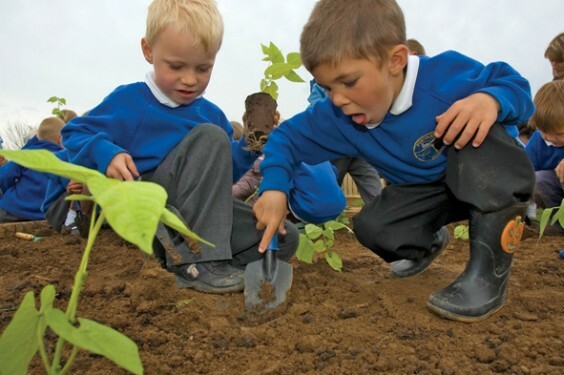 As we are partnered with BT, their website not only contains all the information you need for linked learning about growing food with every area of the National Curriculum – making it easy for teachers – but also a online forum allowing the children to talk to other children all over the country about their experience of growing vegetables. For the actual vegetable garden beds, you can either make your own from ideas on the website showing how to recycle products or you can order pre-made raised beds in recycled plastic that simply clip together. For schools who feel they need some extra help, amazingly BT have hundreds of volunteers who are happy to go and help in local schools free of charge. You can probably understand why I am so keen to be involved – I really believe that with all these elements we can meet this challenge of getting all kids up and down the country, from all sorts of schools, to get growing. And I am hoping to inspire them to take up gardening outside of school and maybe try some vegetable growing at home too. I also hope to get some competitions going later this year and get children doing some design work to see how they rise to the challenge of designing different vegetable gardens, which will all be on the website. The pre-grown vegetable garden going out to schools this spring contains French and runner beans, courgettes, tomatoes, lettuce, carrots, strawberries, seed potatoes, cauliflower, cabbage and beetroot; about 150 mini plants in all. The best bit is that the first 500 schools to sign up will get a free garden through the BT sponsorship scheme. So let your teacher friends, kids and anyone else know about this exciting project, and let’s get the next generation geared up to grow their own food.